› Author Affiliations Funding This work was supported by grants from Conselho Nacional de Desenvolvimento Cientifico e Tecnológico (CNPq), Coordenação de Aperfeiçoamento do Pessoal de Nível Superior (CAPES) and Fundação de Amparo à Pesquisa do Estado do Rio de Janeiro (FAPERJ). Unfractionated heparin (UFH) and their low-molecular-weight derivatives are sourced almost exclusively from porcine mucosa (HPI); however, a worldwide introduction of UFH from bovine mucosa (HBI) has been recommended to reinforce the currently unsteady supply chain of heparin products. 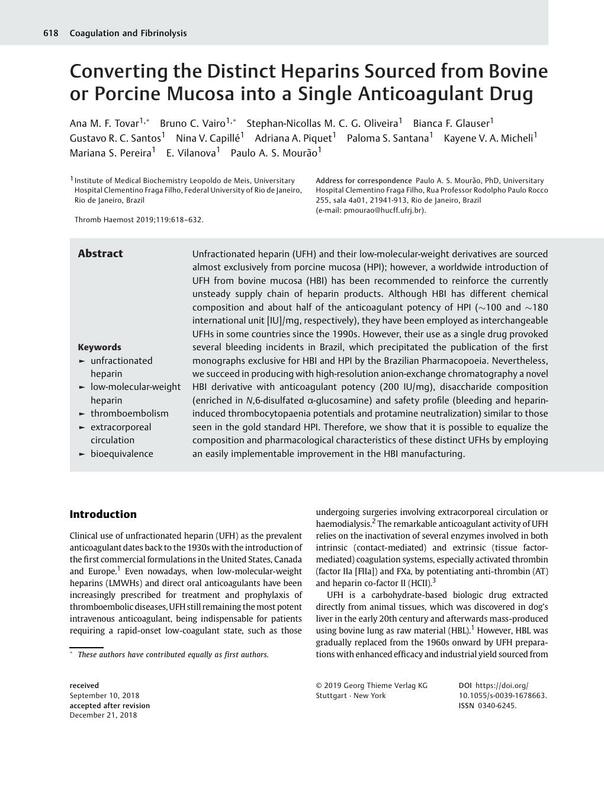 Although HBI has different chemical composition and about half of the anticoagulant potency of HPI (∼100 and ∼180 international unit [IU]/mg, respectively), they have been employed as interchangeable UFHs in some countries since the 1990s. However, their use as a single drug provoked several bleeding incidents in Brazil, which precipitated the publication of the first monographs exclusive for HBI and HPI by the Brazilian Pharmacopoeia. Nevertheless, we succeed in producing with high-resolution anion-exchange chromatography a novel HBI derivative with anticoagulant potency (200 IU/mg), disaccharide composition (enriched in N,6-disulfated α-glucosamine) and safety profile (bleeding and heparin-induced thrombocytopaenia potentials and protamine neutralization) similar to those seen in the gold standard HPI. Therefore, we show that it is possible to equalize the composition and pharmacological characteristics of these distinct UFHs by employing an easily implementable improvement in the HBI manufacturing. * These authors have contributed equally as first authors.